Another happy fashionista was on her way to GoJane. GoJane looks a lot more like an expensive, high-end fashion magazine—Teen Vogue or In Style, say—than an online shopping website. Stunning photos and flashy models dazzle your eyes on every side, and the selection of fashion items is equally enticing. A certain focus-group of clothing shoppers should find themselves feeling like kids in a candy store. Aimed at a smart, young, adventurous clientele, GoJane, which has been around since 1998, is one of the leading sites in its category. Hip, trending fashion is a hugely competitive niche, but GoJane still manages to maintain very high visibility. Google “young women’s clothing” and GoJane comes up in position number three. Shopping online has great appeal—it’s convenient, private, and can be scheduled at the shoppers convenience. Also, you can shop in your bathrobe. But when it comes to clothing, online shopping faces some challenges. The web site itself is probably GoJane’s most effective sales tool. 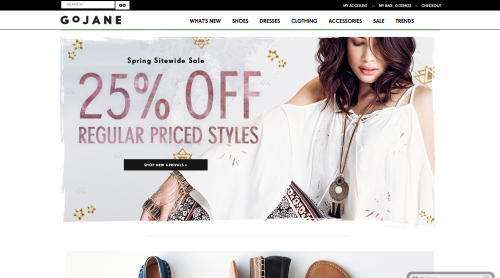 Late in 2012, GoJane received the ultimate validation of its success: it was acquired by a large, publically-traded company, Aeropostale, Inc.—a nationally-recognized shopping mall-based specialty retailer.